January 20 2018. If a true Long Distance Runner is defined, ultimately, by their marathons, then we should take a look at the performances of American Masters athletes in the two World Marathon majors this past fall, Chicago and New York.As a special bonus, I will also review Masters racing at the California International Marathon which was the 2017 USATF Open Marathon Championship. 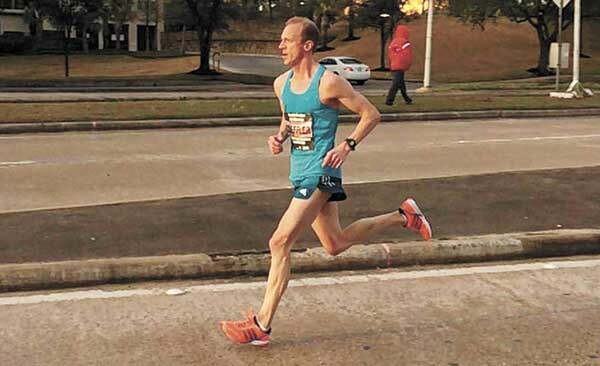 There were plenty of headline grabbers in Chicago with the NOP athletes, Galen Rupp, with his first Marathon major win and Jordan Hasay, with her breakout podium-finish in a marathon. But plenty of Masters Athletes toed the line looking for PR’s and iconic awards. In Chicago on October 8th, they joined more than 40,000 other runners on a partly cloudy morning with moderate winds. Temperatures at 7:30 were in the mid-50’s but older elite Masters runners who were still running in late morning may have found the upper 60’s temperatures a bit less to their liking. Sam Krieg, of Pocatello Idaho, ran away with the overall Masters race, gaining almost two minutes on the field in the first 5K, hitting the Half Marathon in 1:11:38 and bringing it home in 2:26:40, nearly 13 minutes ahead of the second finisher from the US. Philippe Rolly, of McLean Virginia, fit neatly into the slot between Krieg and the rest of the field. Rolly hit the 5K in 18:26, with 20 seconds on his rivals; he upped the gap to nearly three minutes as he crossed the half marathon mat in 1:16:13. By the end he had a 2:34:29 Marathon and a 2nd place Masters finish. Two Chicago runners, Jeff Hojnacki and Anand Parekh, presumably old rivals well acquainted with one another, vied for the third US spot. They hit each mat within two seconds of one another, 18:49-50 at the 5K, 1:19:01-2 at the Half Marathon and 2:29:10 at the 40K mark. In the final 2 kilometers, perhaps the final 100 meters, Parekh edged ahead to take the third spot by one second in 2:37:17. Top Level National Class performances [age grade scores at or above 85%] were turned in by: Sam Krieg, 41, Philippe Rolly, 45, Jeffrey Young, 58, Dave Walters, 63, John Valles, 70, and Dmytro Lebediev, 76. Top 3 Americans*—Outstanding performances for Age in larger print (National Class minimum of 80% age grade or better). 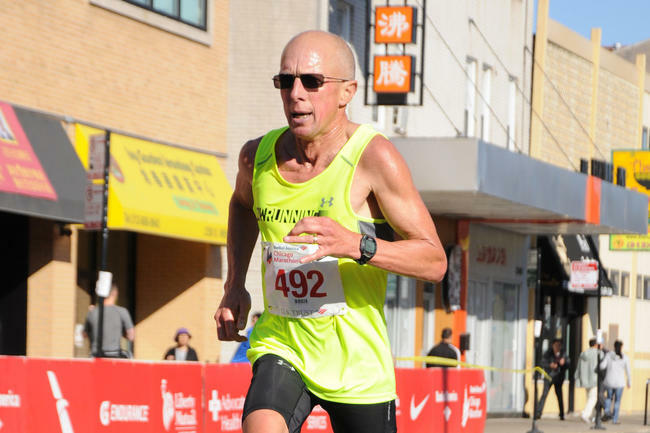 John Koomjohn, 85, of Oswego IL was the oldest finisher, in 7:34:19. *Residence is listed as within the United States; no information on citizenship is indicated. Dot McMahan, one of the top Open performers who just turned 40 this year, ran away with the overall Masters race by the end. In the early going Jenelle Deatherage was able to stay close. McMahan hit the 5K in 18:37 and Deatherage was only 13 seconds back. She was still within a minute when McMahan hit the Half Marathon mark in 1:19:00, but fell away steadily after that. 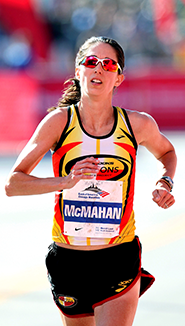 McMahan ran a negative split, covering the second half of the race in 1:18:08 while Deatherage ran her second half nine minutes slower than her first half. Angela Moll started out at a more moderate pace, running 19:25 for the first 5K , and did not hit the halfway mark until 1:22:42, nearly three minutes behind Deatherage. But, like McMahan, Moll had held more in reserve than Deatherage. It appears that Deatherage hit the proverbial ‘wall’ between 30K and 35K when her 5K time ballooned from around 20 minutes or below to nearly 21 minutes and then it took her over 24 minutes to get from 35K to 40K; that must have been a tough time. She did tough it out, but Moll went from nearly 3 minutes behind to just a few seconds by the 40K mark and surged past in the last kilometer to take 2nd in 2:48:59, five seconds ahead of Deatherage. Maggie Shearer kept within 20 seconds of Moll through the first half of the race and then drew even closer as she was only 6 seconds back at the 30K mark. But that was the high point as she was not able to match Moll’s pace over the last 12K and wound up 2 minutes back from Deatherage as the 4th American. Top Level National Class performances were turned in by: Dot McMahan, 40, Corina Canitz, 50, Tina Dowling, 51, and Stacy Nigrelli, 63. 75-79: Hansi Rigney 75 Carmel CA 4:45:28 [78.51]; Mary Dunbar 75 Cleveland Heights OH 6:21:57 [58.68]; Connie Ratzel 77 Chicago IL 6:32:28 [59.59]—Ratzel was eldest US competitor to finish. The big noise in New York this fall was Shalane Flanagan’s redemptive win, defeating Kenya’s Mary Keitany by just over a minute. But as with Chicago there were plenty of Masters story lines as well on Sunday, November 5th. Overcast skies with mid to upper 50’s temperatures and winds 4-9 mph greeted the competitors, pretty good weather for a Marathon! 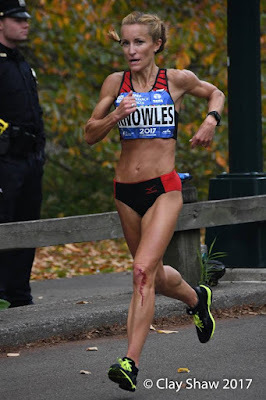 North Carolina’s Laurie Knowles was the class of the Masters field, clocking 19:14 for the first 5K and leaving all her rivals over a minute back. Her 1:17:58 split at the halfway point gave her ten minutes on the field, and she brought it home as first Masters in 2:40:09 with almost twenty minutes on the field. But there was quite a tussle for 2nd as left than a half minute separated the two chief contenders, Tammy Richards and Brenda Hodge, at the finish line. Richards covered the first 5K in 20:27 with Hodge a half minute back. The gap grew to a minute when Richards covered the 15K in 1:01:38. That was the high point for Richards as Hodge began to slowly reel her in. Richards had a 1:27:31 Half Marathon split with Hodge now only 44 seconds back. By 30K the gap was down to 4 seconds; Hodge passed Richards and had a 28 second gap of her own by the 35K marker, which she crossed in 2:27:32. But Richards fought back and with only two kilometers to go, Hodge’s lead was back down to a single second. Whether Hodge was aware of Richards breathing down her neck or not, Hodge was able to find the reserves for a snappy finish, kicking in for a 2:59:23 finish and a 23 second gap on Richards. A World Class performance [Age grade score at or above 90%] was turned in by Joan Gerold, 68. Top Level National Class performances [Age grade score at or above 85%, but below 90] were turned in by: Laurie Knowles, 40, and Sharlet Gilbert, 66. The Overall Masters race for the Men was fought out in the midst of the Open contest as two of the most decorated Masters Runners of the past twenty years, Abdi Abdirahman and Meb Keflezighi, contested for the Open and Masters titles at the same time. They ran together for the first 10K hitting the split in 31:56. They were still in the lead pack at the Half Marathon split, hitting it in 1:06:14 and 1:06:16. The same was true at 30K but that was when Abdi stayed with the leaders and Meb started to fall back; Abdi’s 35K split was 1:49:37, with Meb 20 seconds back. Abdi continued to pull away over the final 7 kilometers, crossing the finish line in 2:12:48 while Meb arrived at 2:15:29 in 2nd. Needless to say they both had over 20 minutes over the first ‘every day’ runner to finish. Michael Arnstein and Knox Robinson battled for the honor of being the first Masters finisher who was not already a global celebrity. Robinson hit the first 5K split in 18:20 with a half minute lead on Arnstein. From there to the halfway point, Robinson added steadily to his lead as he crossed the halfway mat in 1:16:46 with nearly three minutes on his rival. Arnstein took 8 seconds back in the next 3K but then Robinson righted the ship and the gap held steady for the next 10K. But then Arnstein started to make real inroads, dropping the gap to a minute and a half by the 40K mark. By then it was too late; Arnstein continued to cut into the lead but Robinson held on to claim the third spot in 2:36:46 with a 55 second gap to Arnstein. 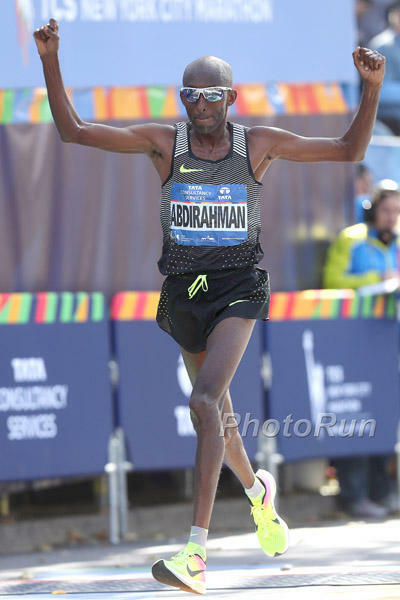 World class performances were turned in by Abdi Abdirahman, 40, and Meb Keflezighi, 42. 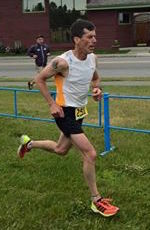 A Top Level National Class performances was turned in by: Dave Walters, 62. Although not as storied as the Chicago and NYC Marathons, the California International Marathon had the distinction this year of being the USATF Open Marathon Championship. As there was no Masters Championship in 2017, that distinction may have attracted the attention of some of our swifter Masters Marathoners. 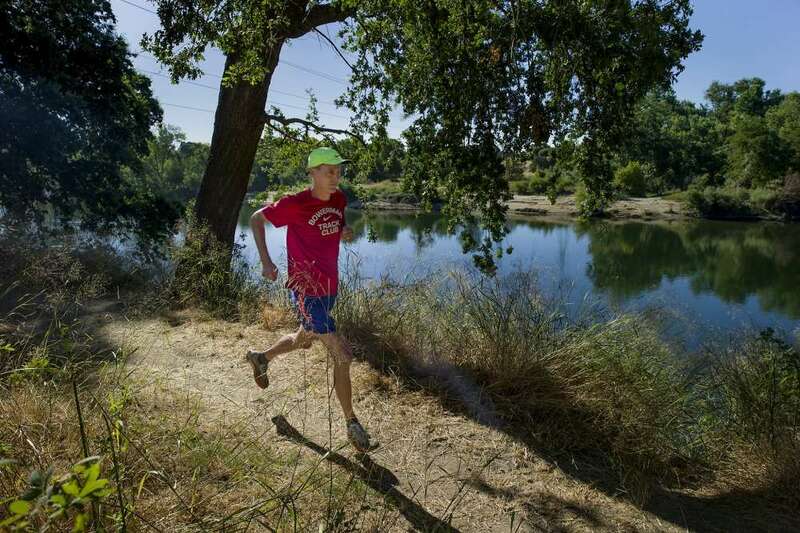 In 2018 they, and other Masters Runners, will have the opportunity to race for a National Marathon Championship at the Snohomish River Run a few miles north of Seattle, on October 14th. Run for over 30 years, the CIM course is point-to-point, running downhill overall from Folsom Dam to the State Capitol in Sacramento. With a drop of over 100 meters, the course is not record eligible but it should be a good course for PR’S. On December 3, 2017 at 7 am, a strong collection of elite Masters Marathoners lined up behind the Men’s Professional Elite field. The temperature was 40 degrees, the skies overcast and the winds calm, auspicious conditions. The temperatures rose as the morning moved along and the marathoners dropped down toward sea level. But the main change was that the skies became clear; the temps only rose to the mid to upper 50’s, and the winds remained calm. The field included Tom Clarke, who finished 3rd overall and 1st Masters at the Newport (OR) Marathon; Emisael Favela, who finished as 4th Masters at the 2017 Chicago Marathon; 2014 Seattle Marathon winner, Shaun Frandsen; two-time [2012, 2016] Olympic Marathon Trials qualifier, Eric Loeffler; Sam Teigen, 7th Masters finisher this year UA NYC HM and 19th at the Boston Marathon; Olivier Vrambout, who finished 2nd Masters in the 2017 Twin Cities Marathon and 3rd at Grandma’s Marathon; Michael Wardian, winner of the Abbot World Majors 2017 Seven Marathons on 7 Continents in 7 Days Challenge, and 2nd place finisher at the 2014 USATF Masters Marathon Championship; and Olympic Trials steeplechaser and 2015 National Masters Marathon champion, Clint Wells. 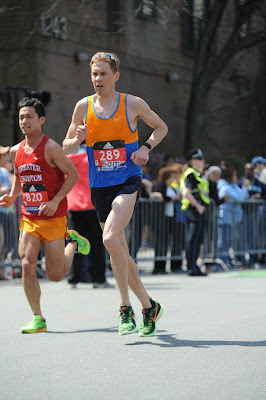 Loeffler left no doubt of his intent, covering the first 10K in 32:31. The only runner to stay oithin a minute of Loeffler was Vrambout, with Wells a full minute back, Frandsen a minute and a half, Wardian 2 minutes, Clarke two and a half, and Teigen and Favela over three minutes behind. By the Half Marathon split, Wells had passed Vrambout but was now a full 2 minutes behind Loeffler, who strode across the mat in 1:08:31. Vrambout, Frandsen, Wardian, Clarke,Teigen and Favela followed. Running the second half in 1:09:03, Loeffler decimated the field, running 2:17:34, to win by almost 4 minutes. Wells could not close at all on Loeffler but he put plenty of distance between him and the rest of the field as his 2:21:27 was good enough for 2nd place with a margin of 7 minutes. Vrambout still had 26 seconds on Frandsen at the 20 mile mark but Frandsen was able to close faster, claiming the final Masters podium spot in 2:28:47, just 17 seconds ahead of Vrambout. Thirty-eight seconds later Clarke claimed 5th while Favela ran a strongly negative split race to take 6th in 2:30:08, with Teigen in 7th. World Class performances [age-grade 90% and above] were turned in by Eric Loeffler, 40, Clint Wells, 42, Ken Pliska, 52, and Iain Mickle, 56. Top Level National Class performances [age-grade 85% but less than 90] were turned in by: Olivier Vrambout, 43, Sam Teigen, 43, Tom Clarke, 46, Chris Knorzer, 48, Edward Randolph, 48, Martin Rindahl, 54, Robert Economy, 53, Timothy DeGrado, 57, Jacob Nur, 62, and Joseph Burgasser, 79. As suspected, the sharks were in the water; a strong turnout resulted in national class performances by the entire podium in every age division for both Women and Men from 40-44 through 60-64. The field included several top flight Masters runners. Hilary Corno finished 9th among the elite women and was first Masters Woman at the 2016 CIM in 2:43:03. She also finished 3rd in her age group at Boston in April in 2:42:16. Jenelle Deatherage was 6th woman overall and first in the 35-39 division at the 2016 Twin Cities Marathon. In the BOA Chicago Marathon, as reported above, Deatherage was the 3rd Masters Woman across the finish line in 2:49:04. 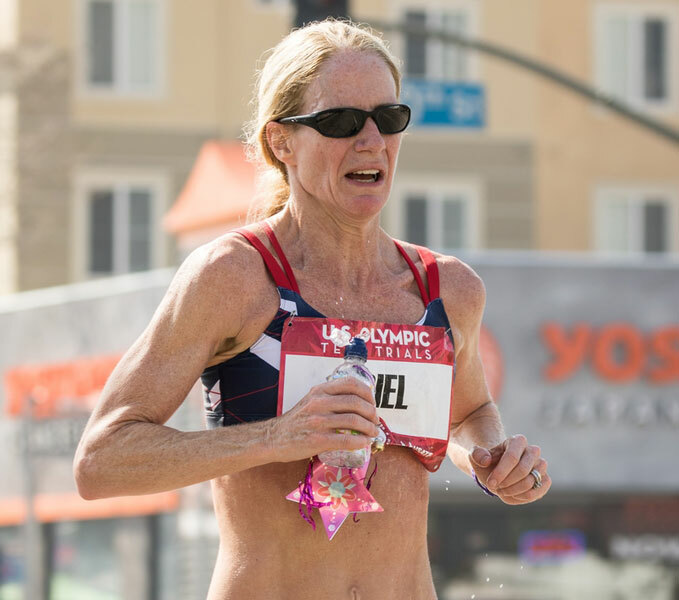 Molly Friel finished 2nd at the 2015 USATF Masters Marathon Championship at the Twin Cities Marathon in 2:54:42 before finishing 74th overall in the 2016 Olympic Trials Marathon in 2:51:17, outrunning many of her younger rivals in those very hot conditions. Like a lot of other runners, Dawn Grunnagle had a tough day at the Olympic Trials Marathon but she did finish, albeit in a bit over 3 hours. After that she competed in the 2016 TCS NYC Marathon, finishing 2nd in the 35-39 age division in 2:49:37. 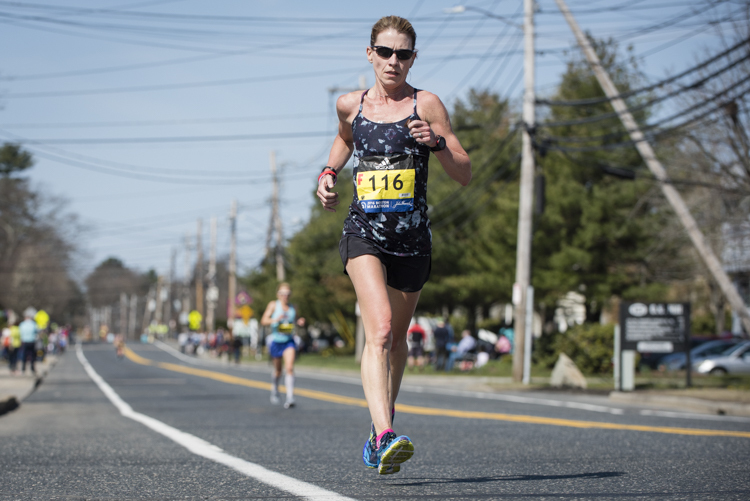 Kate Landau finished 2nd in her age division at the Boston Marathon in April, running 2:40:02. Tanya Molleker is primarily a triathlete if I have identified the correct person; there is a puzzle about reported age though, as that triathlete is listed as age 37 in 2017 events and the runner in this event is listed as 42. Landau went off with a purpose, hitting the 10K point in 36:36 with over half a minute on her closest pursuer, Grunnagle. Molleker was another 22 seconds back in 37:35 with Deatherage trailing her by 10 seconds, Corno another 15 seconds back and then Friel in 38:41, biding her time. Between there and the half marathon, Grunnagle closed down on Landau as they went through the halfway mark in 1:18:29 and 1:18:30. Molleker was now a minute back, having passed Deatherage who was a minute and a half back at 1:20:00. Deatherage’s lead over Corno had stretched ever so slightly to 18 seconds, with Friel still being patient coming through in 1:21:54, a good 90 seconds after Corno. Grunnagle made a strong move between the halfway point and the 20 mile mark, dropping her pace from 5:59 per mile to 5:55 per mile, creating almost a 3 minute gap back to Landau who, in turn, had only a 23 second lead on Deatherage. Molleker was another 18 seconds back with only a 9 second lead on Corno. Perhaps this would not be Friel’s day as she was now over 2 minutes back from Corno in 2:05:09. The final 10K saw Grunnagle pouring it on even more, dropping her pace now to 5:52 and finishing in 2:35:42 with a strongly negative split of 1:18:30/1:17:12. In the end she had almost a 7 minute margin on the 2nd place finisher-Wow! Deatherage had made a huge effort between the Halfway mark and 20 miles to cut Landau’s lead to 23 seconds but she could only take another 4 seconds out of the gap over the last 10K as Landau rallied to keep her at bay 2:42:39 to 2:42:58. 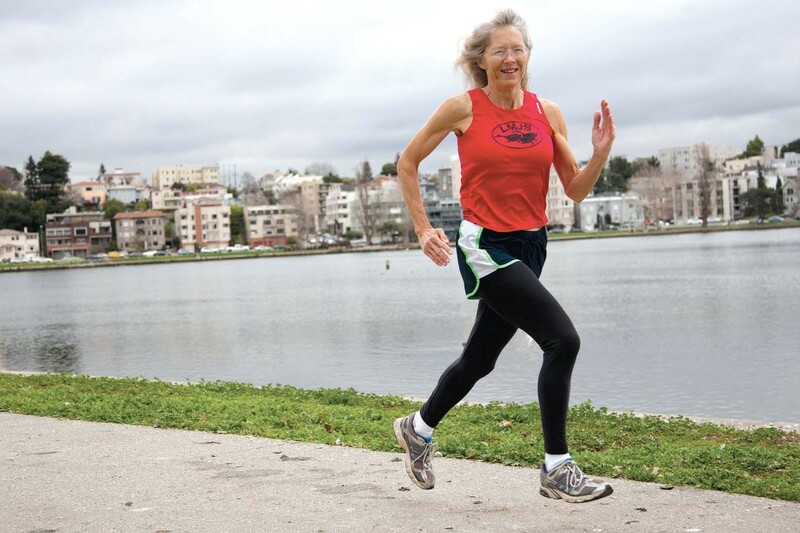 Friel, the seasoned veteran, continued her steady pacing at just about 6:15 per mile, which was enough to carry her past Molleker by 52 seconds and within a minute of the 3rd place finisher, Deatherage. Corno had a tough final 10K, finishing three minutes further back. World Class performances [age-grade 90% and above] were turned in by Molly Friel, 50, Susan Loken, 54, and Karen Kunz, 62. Top Level National Class performances [age-grade 85% but less than 90] were turned in by: Dawn Grunnagle, 40, Kate Landau, 41, Jenelle Deatherage, 40, Tanya Molleker, 42, Amy Halseth, 48, Sheri Piers, 46, Jennifer Bayliss, 47, Kami Semick, 51, Janet Norem, 60, Sharlet Gilbert, 66, Liz Friedman, 69, and Hansi Rigney, 76. The oldest finishers were: Larry Lieb, 84, of Carmichael CA and Elizabeth Buffum, 80, of Beaverton OR. And what will 2018 hold in store for distance runnerw? Boston, Chicago, and New York will still be the chief destinations for Masters Marathoners but in 2018, for the first time since 2015, there will be a USATF Masters Marathon Championship, on October 14 2018 at the Snohomish River Run Marathon in Snohomish WA, just north of Seattle.Be there if you want to be a National Masters Marathon Champion!